Summer is definitely over and we’re already fast approaching cold weather here in Canada. Temperatures are dropping into the single digits here in the west and I heard out in the east they’re already going below zero. However, there’s this flaming wildefireaday (wildfire + Friday – a term I just coined as I was writing this) event that is fast approaching. It’s the Black Friday frenzy. What else am I talking about but none other than the Black Friday frenzy. It’s that time of the year when Black Friday event and sales are fast approaching. People go crazy buying all sorts of stuff in the malls, stores and outlets. I am fascinated with how much time and effort most of us put in trying to get the great deals out there. I won’t be a hypocrite and tell you I’m not guilty of this. Actually, just a few hours ago I was surfing the Internet on what are going on sale in Best buy and Amazon. So yes I am guilty of participating in this Black Friday frenzy. It’s 3am or 4am or even 5am and your alarm just went off and woke you up all of a sudden. Quickly jumping off of the bed you head to the bathroom to brush your teeth or if you’re fast enough get a quick shower. Afterwhich, you went and got your “papers” then you went to the garage, start your vehicle and off you go. Driving along the road, it’s obviously still dark. Your “papers” are on the passenger seat. Your lights in the car are turned on. Trying to wipe your eyes to make sure you’ve adjusted your sight, you skim through the papers as you drive. These papers are store flyers. Skimming through these flyers, you’re trying to find that item you’ve highlighted last night. You want to make sure you’ve read through the ad and know where to get it. You get to the parking lot of the store and already you noticed there’s people lined up at the entrance. Some of them even brought a stool to sit on just so they’re comfortable while waiting. You may even find some who have sleeping bags that they’re probably rolling up by now as they just slept through the night outdoors just to ensure they’re at the very front of the line. Finally, the lights in the store went on and the doors open. This is when the frenzy starts. People rush into the store and head towards the store section that they’re intending to go. You too are running. Like running for dear life. You noticed that there’s already a bunch of people that are ahead of you and they’re heading towards the same section of the store. You’re hoping there’s enough stock available that you can still get your hands on this great deal that you’re after. Like I said, I’m no hypocrite, I too have gone through the same experience I described above. I think I did once or twice. People go crazy over these Black Friday deals and sales. And who wouldn’t, there really are some good buys that you can find during this season so shop away. Meanwhile, I’m not going to talk about some gadget or merchandise that’s on super steroid discount or on sale. 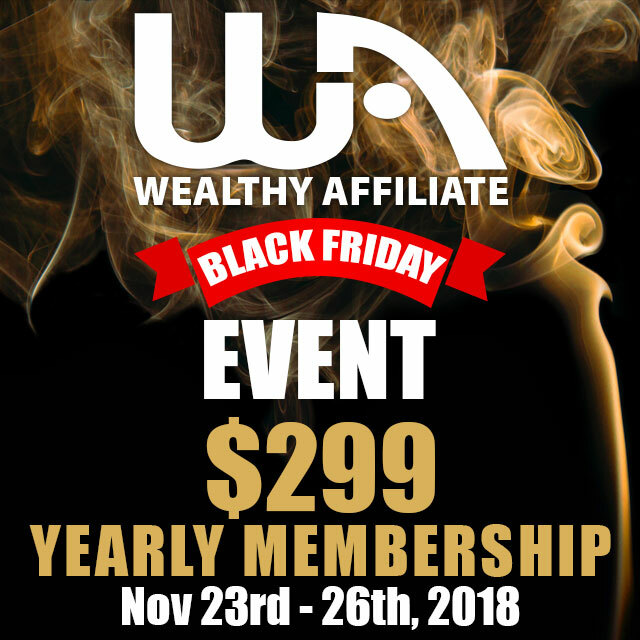 I’m here to invite you to Wealthy Affiliate’s Black Friday event. I know, I know this might not be what you’re expecting. I apologize if I held off this far to tell you and probably burst your bubble but stay with me for a little while longer since, if you’re still reading this by now, you’ve already spent some time here and I’ve entertained you for a little bit already. So to cut to the chase, I’m inviting you to try out Wealthy Affiliate plain and simple. But to emphasize this is the best time of the year to actually take advantage of their discounted Black Friday offer for an annual membership. You can read about my personal review of Wealthy Affiliate and more details of what they are about and what they offer by going to this page. Wealthy Affiliate is a training platform that can help you start up an online business mainly in affiliate marketing but you can also learn a whole lot. The community within WA is also amazing as you’ll meet real-life people who have also gone or currently going through the journey. Everything you’ll ever need is in there. From building a website, then setting up a domain, to hosting your site, WA has it all for you so you won’t go all over the place trying to figure out how to set up or build your website. It does not matter if you completely have no idea on how to start an online business or you’ve already put up an online business, WA has so much to offer. I understand we all want to grab the best deals out there this Black Friday season, however, why don’t you consider to be on the other side of the fence. Why not be the one marketing and selling these items and earn some commission by doing so. Instead of being the consumer or the buyer, be one of the sellers or marketers and cash in on the Black Friday frenzy. Rather than taking money out of your pocket, wouldn’t it be nice to put some extra income into your pocket. Affiliate Marketing alone is a multi billion dollar industry so if you’ve been given an opportunity to take a piece of slice of that pie, will you not take it? Wealthy Affiliate is a good platform to learn from about this venture. If you’re still unsure if this is for you or not, WA has a free Starter membership. I invite you to check it out. You can check out their boot camp training to help you assess and evaluate if this is something that you’re willing to try out. WA’s Black Friday event starts on Nov 23rd – 26th. We’re still a few days before the start of this awesome deal so why not try out the free Starter membership and figure out for yourself if this is an endeavour you’re willing to give a try. Now once you’ve given them a try and have figured and decided for yourself, you can then convert to a Premium membership at $49 per month. However, if you do have the financial buffer or capacity, I highly encourage you to take advantage of the Black Friday deal for $299 for an annual Premium membership. I personally did as well back in 2016. I know it’s not cheap but let me tell you that it is reasonably priced as compared to the other ones you’ll find out there in the market. Believe me I myself have already looked around and this by far is the most reasonably priced (not to mention the awesome Black Friday discount) and very much worth it. So come join me in this adventure. The community and culture inside WA is amazing I can tell you that for sure and of course don’t hesitate to reach out to me as well if you have any questions. Thank you for staying with me this far. I appreciate the time you’ve given reading my blog. I do hope to see you inside WA and come join the journey with us. Have a pleasantly blessed day! Cheers! Blackfriday is considered the best time to get involved in wealthyaffiliate if you are looking to become a member of this awesome platform. From experience I can tell you that this is an awesome platform and joining is going to be the best decision you make concerning your financial future. I appreciate backing me up Jay on how truly awesome WA is! Cheers! Hi Mark, i like the word “wildefireaday”, it was the first things that got my attention in the article. in as much as i am a part of Wealthy Affiliate and enjoying it, i must add, i would like to ask this for the sake of those who are thinking same. What happens after the black friday November sales, can one still get on board with this awesome platform? Have a good one Mark. I can only agree that this Black Friday offer is great. Wealthy Affiliate University is unseen on the Internet marketing market.It offers not only excellent hosting at a good price but also a non-exhaustive base of knowledge.Even the monthly fee of the most popular web Hosting companies is higher than the WA Black Friday deal. Very true indeed. Just the price of getting a good hosting provider would cost you a significant amount of money so this Black Friday deal by Wealthy Affiliate is truly a steal. Thanks for andrejs for the comment. I like how open and honest the topics are. Knowing that you started from scratch just like any other person is a cool story to share. I do not agree with The Problem of God concept at all definitely made me not want to read anything else after, but still very honest and easy flowing. Thanks for the feedback Kira. I respect your opinion on The Problem of God and you are entitled to that. I’m sorry that made you not read anything else after. I just hope you’ll not discount reading through the other posts just because of one that you do not agree on. We’re all entitled to our own values and beliefs. In any case thanks for stopping by. This means you can get a daily premium membership that’s cheaper than a cup of coffee!!! I myself am going to take advantage of this annual price because its a win win and i would be silly not to! If I join the community now for a yearly payment of $299 – what will they be charging next year? Does this Black Friday event go up a few dollars every year or will I be set in at my original price? Hi Chris, you’ve raised a very good question here that I forgot to mention. Once you do take advantage of the Black Friday discount, your annual membership payment will be the same as that $299/year. That’s another cool deal you’re getting with this promotion. You’ll retain that membership fee for as long as you remain a premium member. As for your comment on the seemingly steep price, I agree that it may look like it at the beginning, which is also why I highly suggest to try out WA for free first and see if it is indeed for you. That’s how I myself started with WA. However, I’m pretty sure one will soon realize that this Black Friday promotion is reasonably priced just like I did as well. Premium membership comes with the easy to use website builder, site content tool, web hosting, amazing training courses that’s always get updated and there are also live training sessions weekly on how to build and develop your online business and/or website. And as I mentioned the amazing community within WA is priceless! And there’s even more that you’ll eventually realize once you dive into WA. Hope I answered and addressed all your questions and concerns.